RAPAPORT... Australian jeweler Linneys is showcasing $100 million worth of jewelry featuring rare colored diamonds from the Argyle mine. The highlight of the collection is a ring containing the Argyle Violet, a 2.83-carat fancy deep grayish bluish violet diamond that Rio Tinto recovered from the iconic mine in Western Australia. The stone — the top diamond from the 2016 Argyle Pink Diamonds Tender — is surrounded by 10 round vivid pink diamonds from Argyle, which together weigh 0.83 carats, and two heart-shaped Argyle vivid pink diamonds weighing a combined 0.67 carats. 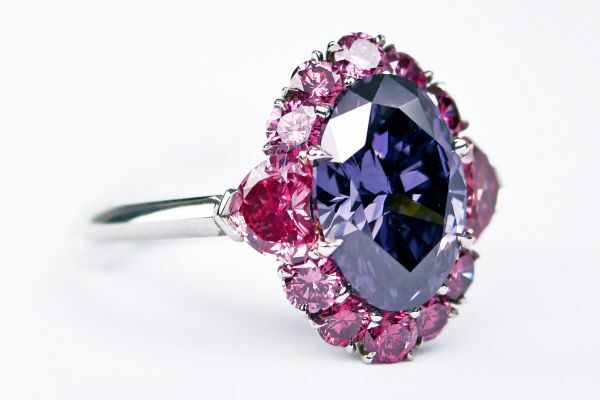 The Argyle Violet is extremely rare: last year Rio Tinto said the mine had yielded only 12 carats of polished violet diamonds in 32 years of the annual tender. New York-based L.J. West Diamonds bought the stone last year for an undisclosed amount. Linneys’ collection also includes the Argyle Thea, a 2.24-carat fancy vivid purplish pink diamond from the 2016 tender now set in a platinum ring.